Pure Beeswax sourced straight from the beekeeper who has hives in the Gold Coast Hinterland. 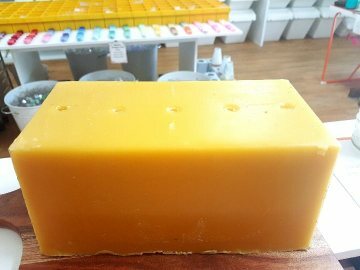 This beeswax is A grade quality and fully filtered. Suitable for pillar candles, container candles, tealights and melts. We recommend blending with 50% coconut wax to minimise cracking and shrinkage of your candle. You will need to experiment to find the best results for your needs. When using beeswax, you will need to "jump up" 2 sizes in your wicks. This is because beeswax is much firmer than soy and requires a hotter flame ( a thicker wick) to burn properly! For example, if your jar is 6cm wide, you would use a CDN 18 wick. We recommend using square braid wicks for pillar candles.